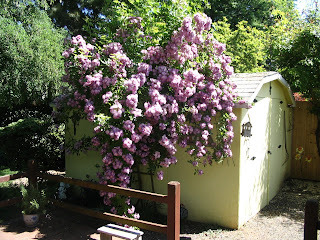 Recently I shared here the story of my great-grandmother Nanny's rose that is growing in my dear mother's backyard. When I took the first pictures the rose was absolutely gorgeous. Now that the blossoms have all opened this is the most breathtaking sight but that doesn't even begin to compare to the sweet fragrance that fills the air. I hope you enjoy seeing it again. Those are the most luscious roses! Thanks for sharing! I'd love to sit there by them and breathe in their lovely fragrance and beauty! Wow! What an incredible rose bush. I can almost smell them from here! Oh, What A Dad I Had! Boys, Ballgames and Bunches of Fun!! !